Left to right: Ervin Liz (‘17), his neighbor Manuel Andela, Ervin Liz’s father Isidro Liz, Colombian Coffee Connection’s main farmer Misael Muse, Jon Baklund, and Tara Baklund. Upon graduating college, Ervin Liz (‘17) developed a business plan and a commitment to selling Colombian coffee directly from farmers. As a member of the indigenous Nasa tribe of Colombia, Liz grew up on a coffee farm and was introduced to Colombian coffee at a young age. 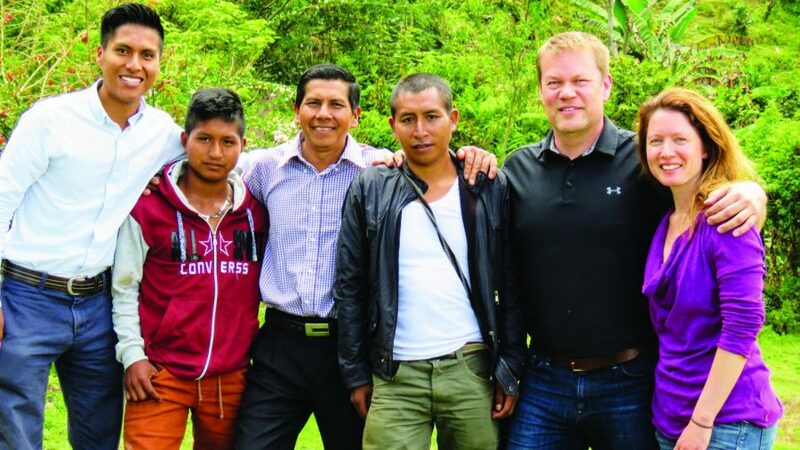 Liz’s personal experiences in the coffee farms of his childhood sparked his business idea and led to the creation of the Colombian Coffee Connection in partnership with Jon Baklund, a lecturer who visited one of Liz’s classes. “I am originally from Colombia; for me, there is a strong connection to my country,” Liz said. Liz came to Luther as an international student in 2012 after completing schooling with the United World College in Norway. At Luther, Liz majored in economics, focusing on finance, management, and communications. It was during Liz’s entrepreneurship course that he met Baklund, who gave a lecture on his entrepreneurial experiences. Although the two kept in touch, Liz and Baklund didn’t join forces until 2017. The momentum from Baklund’s lecture inspired Liz to try and make it on his own as an entrepreneur. “In the spring of 2015, I almost quit Luther,” Liz said. Instead, Liz took a gap year to explore Columbia, teach English, and try his hand at entrepreneurship. After a year of encouragement from family members Liz decided to return and finish his education at Luther. “My sister told me, ‘you need to complete the cycles that you open in your life’ and I realized, maybe I should go back to Luther,” Liz said. Liz regards his year off as a formative experience that helped him realize his entrepreneurial goals. Liz recommends that students seek out internship and job shadow opportunities whenever possible so they have a better understanding of their own skills when they leave college. Liz graduated from Luther in spring of 2017 with a plan for his first business venture and a potential business partner, Baklund. “He had written a business plan and a three-year plan for the Colombian Coffee Connection,” Baklund said. Baklund partnered with Liz, offering entrepreneurial guidance and an awareness of American marketing culture to the business. Their company, Colombian Coffee Connection, buys Colombian coffee directly from farmers of the Nasa tribe, cutting out the middleman and giving profits back to the community when needed. According to Baklund, their primary focus is to educate consumers and contribute to the Nasa people. Liz’s direct connection to the Nasa tribe and to coffee farming was the catalyst for their company’s objective. Ervin Liz (‘17) and Jon Baklund in front of the Luther Bell. The Colombian Coffee Connection roasts small-batch, premium coffee in Minneapolis, Minnesota. They pay the farmers fair wage, while also offering financial support to the area through their humanitarian initiative, Coffee with Heart. The Coffee with Heart project donates 10 percent of coffee profits back to the indigenous Nasa Community. As a business partner, Baklund appreciates the unique perspective that Liz offers. “Ervin is dynamic and smart … he is very good at allowing things to happen,” Baklund said. Baklund is one of many entrepreneurs that speak in Professor of Management Tim Schweizer’s entrepreneurship course, which features regional business owners, Luther alums, and global entrepreneurs. Liz fits all three descriptions. As a result, in March, Baklund and Liz presented their own entrepreneurial experiences with the Colombian Coffee Connection to the class. In his entrepreneurship course, Schweizer has a different speaker present to his class each week and focuses on the “non-linear” nature of each entrepreneur’s journey. Colombian Coffee Connection has only had one full year of business, but Liz and Baklund are looking forward to the future of their small-batch Colombian Coffee. “People like the company and people like the cause,” Baklund said. 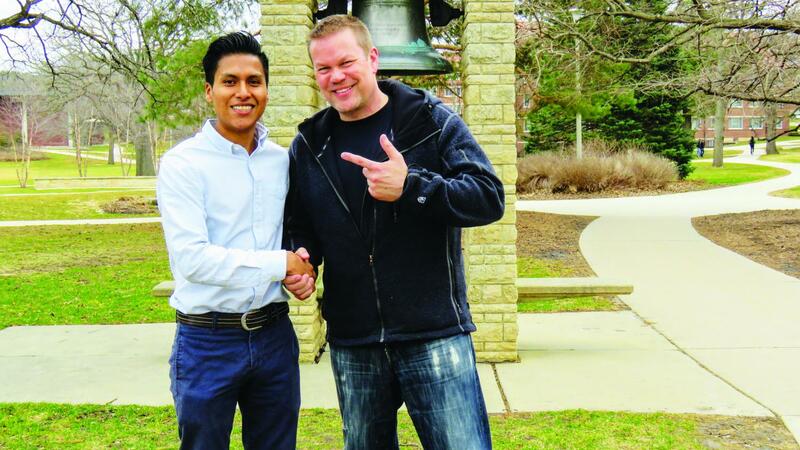 For Liz, the Colombian Coffee Connection has helped him apply his knowledge from his time at Luther to a cause that he truly cares about.